During the conference call discussing the HP purchase of Palm, HP VP of Strategy and Corporate Development Brian Humphries dropped what we can only read as a hint at something we think webOS would be awesome at: tablets. 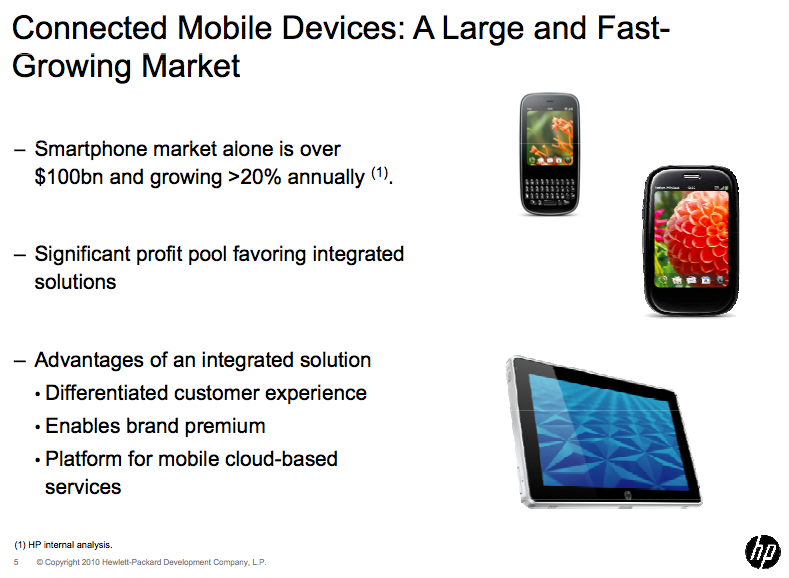 Above is Slide #5 from the conference call, on which you can see the Verizon Pre Plus, Pixi Plus, and the HP Slate. Slide #6 cites the key things that Palm and HP bring to the table, with Palm bringing webOS and loads of experience in the sector, while HP brings loads of cash and scale. Scale, as in deploying webOS onto multiple form factors, like tablets. Of course, nothing concrete apart from the purchase itself was announced, but it’s clear that HP is psyched about what they can do with Palm and webOS.